To bake bread is a very time consuming task-sometimes it can take the whole day to make a loaf of delicious bread. You have to treat it like a child; it requires attention and care. There's a lot of dough kneading to do, rising time (which can take hours), and you also have to control the temperature in the room. However, that doesn't mean that dry yeast bread baking should be avoided. There's nothing like the smell of fresh bread filling the house. You might even feel a sense of accomplishment, which is always a good feeling! If you do decide to take on the task of baking bread, well done! 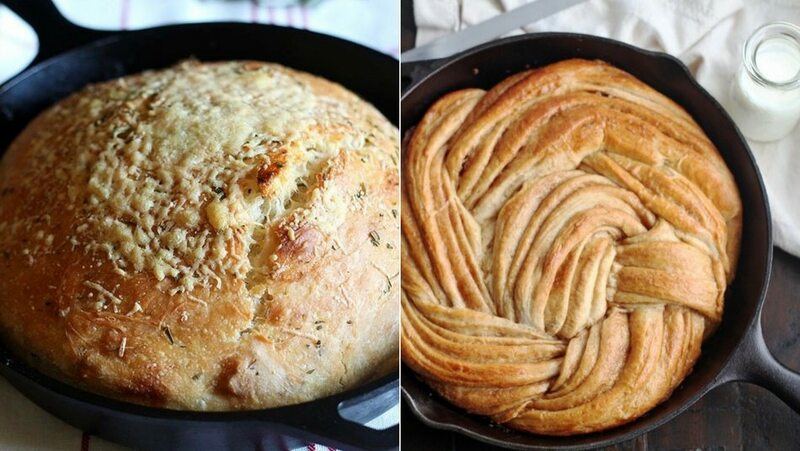 In fact, did you know that there are a bunch of simple bread recipes that you can make on your trusty cast iron skillet? I highly recommend purchasing one because they are so versatile and can really be used for anything-dinner, dessert, dips, breakfast and of course, bread. They come in a variety of brands and colors and also hold up to heat well. Cast iron skillets are a real kitchen staple and an all round reliable pan. Perhaps it's time to start writing up that Christmas list! Here is a list of our favorite recipes for easy and homemade, cast iron skillet bread. One of my favorite breads is focaccia! It's soft on the inside, has a nice crust on the outside, and the addition of rosemary leaves is exceptional. Even better is the fact that it takes only one hour to make and that includes the rising time. A helpful trick from this recipe: While you're making the dough, heat up the oven to 200 degrees. Put the rolled out dough (that's in the cast iron skillet) in the warm oven and immediately turn the oven off. This will be a nice warm place for your dough to rise quickly! This bread is made for dipping in olive oil or marinara sauce. This beautiful cast iron skillet bread is one of the simplest recipes for you to make. It requires no kneading-just mix the ingredients in a large bowl with a wooden spoon and let it rise for about an hour and a half. This whole wheat bread would be great for dipping in oil or even spread with something a little sweeter, like this apple butter. Get the bread recipe here. We love Irish Soda Bread in my house (my husband is a pro at making it). This cast iron skillet bread is a little different because it's not your typical yeast dough; it has baking soda as the leavening agent. There are many variations to Irish Soda Bread-we sometimes use currants instead of raisins and we also add in a little orange zest for extra flavor. The best way to eat this is warm with butter. So delicious! Here's the recipe. Naan is a type of flatbread, mostly served with Indian food. It's great for filling with different types of meats and also delicious on its own! Did you know that you can use it for making pizza, too? It is highly recommended to make this recipe on a cast iron skillet in order to get a nice crisp on each flatbread. Here's the recipe. Here is another homemade bread that requires zero kneading time! This is a white bread recipe made with all-purpose flour, but feel free to try using different flours. You can do half all-purpose flour and half whole wheat flour. This bread is flavored with fresh rosemary, which has amazing woody flavor and it's topped with Parmesan to form a cheesy crust. Here's the recipe. These pull apart rolls are soft, buttery and full of dried herbs like rosemary, basil and parsley. While this dough does take a little longer to make, it's totally worth it in our books. The dough goes through two rises-the first is for two hours and the second is for about 35 minutes right before they go into the oven. The rolls can be left in the refrigerator for a week or you can freeze them for up to three months. Here's the recipe. Bread is one of my all time favorite foods and it's really hard for me to pick just one specific type that is my favorite. I do have to say though, olive bread is on the very top of my list. It's so delicious and I love the acidic flavor from the olives. This recipe is super easy and take about five minutes to prep. There's also no kneading involved, just some time to let the dough rise. Perfect to go along with a nice dinner. Get the recipe here. Isn't this cinnamon swirl bread beautiful? This sweet cinnamon sugar bread is rolled out and braided to create its signature look. It's pretty easy to make and would be great to eat on its own with a little butter. If you end up having any leftover, try making French toast or even bread pudding with the extra. You'll definitely impress your friends and family with this bread! Here's the recipe. 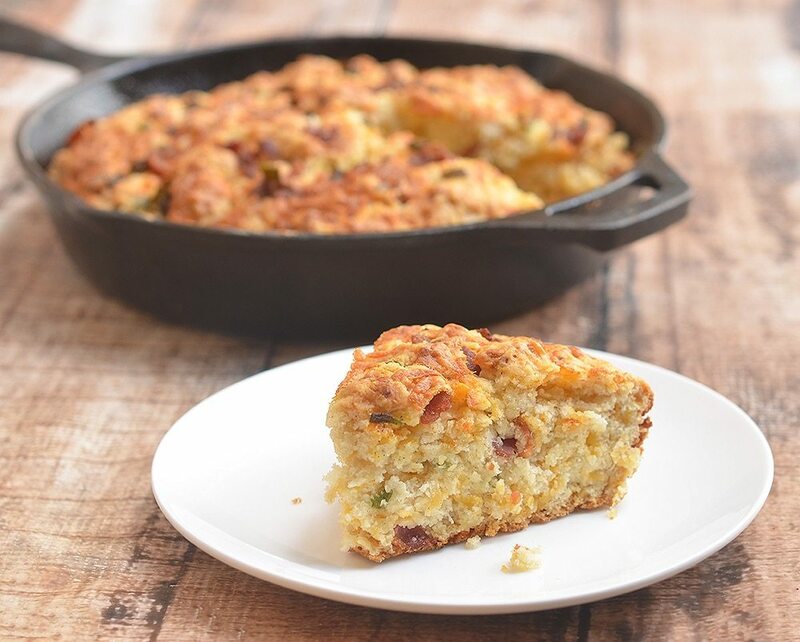 This rustic and savory bread is filled with crisp bacon, green onions and sharp cheddar cheese. There's also beer mixed in to the batter, so how bad can that be? This bread would be great alongside chili, soup or your favorite beer! This bread is considered a quick bread because it's fast to make and the leavening agent is baking powder instead of yeast. Here's the recipe. Scones are the perfect breakfast if you really was to indulge. Sweet or savory, they're all delicious and satisfying! This recipe, from Joy the Baker, is on the savory side and filled with diced roasted red peppers, salty feta cheese and cracked black pepper. The buttermilk in this recipe helps tenderize this amazing dough! It's best served warm from the oven, but I'm also thinking this could be a nice base for an egg sandwich! Here's the recipe. These rolls are taken to the next level because they surround a center filled with cheesy spinach and artichoke dip. The dip is creamy and packed with flavor, also a kick of heat from the Sriracha sauce. Simply pull apart a roll and dip it in! This easy bread can serve as a great appetizer for large gatherings and it's sure to be a big hit. Here is the recipe. Pita bread is pretty similar to naan bread because it's great for dipping or filling with meats and vegetables. This recipe for homemade pita bread starts off by making a sponge for the dough. A sponge is a mixture of flour, water and a little bit of yeast and it's allowed to sit and ferment and get nice and bubbly. It's a little looser than the actual dough and it's added in to the rest of the dough mixture. The sponge will add nice flavor to the final product. This cast iron skillet bread recipe makes about ten pitas and they also store well in the freezer. Find the recipe here. Banana bread is perfect for breakfast, dessert or just for snacking. It's also a great way to use up all those overly ripened bananas. There are so many different variations, but this one is made in your cast iron skillet. This bread will smell amazing in your kitchen of spices and ingredients like mace (or nutmeg), allspice, brown sugar and pecans. I'm sure a handful or two of chocolate chips wouldn't hurt either! This yeast bread is so simple! It requires five ingredients and there's no kneading involved. It does take some time to rise, so it's great to mix together in the morning and leave it out to rise while you go to work or run errands. You can even mix the ingredients before you go to bed and let it rise overnight. It's filled with mashed roasted garlic and flaky sea salt, which is a great combination! Roasted garlic is really easy to make (you can also buy it at the store). Take a whole bulb of garlic and peel away at some of the layers. Cut about 1/2 inch from the top of the cloves so some of the garlic is exposed. Place cut side up a rub with olive oil. Cover the bulb with aluminum foil, place on a pan and bake at 400 degrees Fahrenheit for about 30 minutes until the cloves are soft and golden. This is beautiful rustic bread that you can make by hand, in a mixer or with a bread machine. It has a lot of flavor from the nutty oats and sweet maple syrup. This bread would be perfect for sandwiches or for toasting. Here is the recipe. This post was originally published in 2017, but has been continually updated since.